What I like about what Katy did with this article is that she showed games in the classroom that do not have to pivot on the “digital natives” argument. Kids like games, not all of them, but many kids are interested — it really doesÂ take a facilitator to motivate people and to create transfer to academic “work” or formal learning even if there is a high-interest activity available. Teachers are important to practice and modeling to create a successful habit of learning the process of creating transfer. That is, the kids need to learn how to learn, and think about learning. We all need to learn to question quality, question, raise and praise standards, be particular, and really think through the cognitive, social and cultural processes of comparison, combination, contrast, and reduction. there is clear criteria in the signal words for qualities and process. What is the difference between learning with games and learning with text books? Play as the learning mood (subjunctive mood) and therefore the social structures surrounding the games. Also, kids have the ownership, and this puts the teacher in the role of facilitator who must be accepting of guiding the learner though the criteria–so if you have lousy criteria, and are not consistent with what your signal words mean in quality and process, expect lousy work,Â if not riots. But if you put forward bad games, no curriculum or bad learning objectives, it is just like reading out of those boring collections of literature texts, without merit, and without no street cred. The games are not the technology, the curriculum design surrounding the games are the technology. 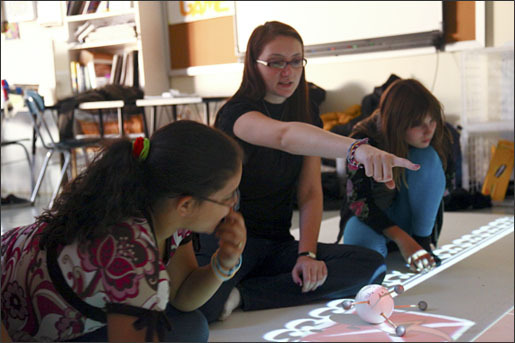 The computers only mediate good instructional design that teachers have always done in cooperative learning– and this exists in board games as well as it has in apprenticeship organizations to learn trades– just like it does in live action role plays,Â that in some genres,Â are what evolved into video games. Good instruction is just good instruction. Hopefully this article takes folks towards that direction. Because we can take the games and go a little further than merely connect. Just playing a game may increase some cognitive functioning in low functioning people, but that does not mean that they can take that increaseÂ in in-game problem solving to in-life problem solving. Being good at the game does not mean you will pass a reading test. Does the reading test really matter? Should they be able to pass it? Yes. They are not that hard. 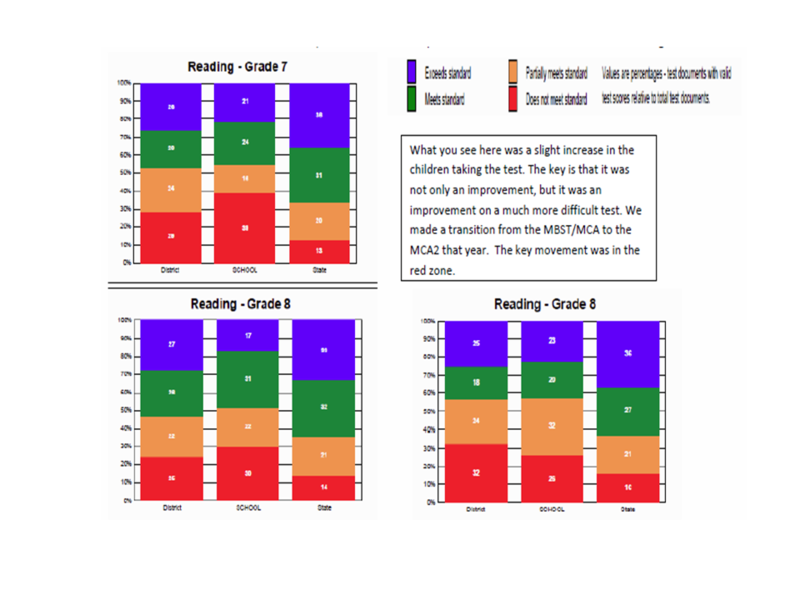 The work I have done surrounding games has led to improvement in reading scores. You will notice that between Seventh grade (top-left) and the Eighth grade the following year (bottom-right) there was significant improvement in the school column. During that eighth grade year, I had all of the eighth -graders–but more importantly, we had a significant gain in a year when we switched from the Minnesota Basic Skills Test/ Minnesota Comprehension Assessment to the MCA2, which is a significantly harder test. What you see in comparing my eighth-graders with the year before was the movement from the bottom (who are the hardest to move btw) , the increase in students taking the test (they were all coming to class because of the curriculum), and the amount of students who met or exceeded a higher standard. I must admit, I built my games unit on the standards and my background in reading comprehension made games an easy connection — games are another narrative with all the same literary elements and genre patterns. The bottom line, they surpassed expectations. We were expected to go down 12%. The majority of my curriculum that year was in studying video games as new narratives. There is a lot to learn in a game, but there is a whole lot more to learn outside of the game in documenting, listening, presenting ideas, and extending them, than just playing the games themselves. If you want, there is a whole bunch of games curriculum on my teaching blog for language arts, reading, engineering, computer science, etc. Everything from board games to curriculum for analysis of a time line. You might notice that they are set up to be run like a game. I am hoping that this article makes a start for teachers embracing a model where they consider Learning by Design.Interestingly, games are also involved in assessment, and kids like to know their scores. The scores are an indication of learning. And the learning is the fun part, the content and the problems are hard–and learning is not always easy, but it can be desirable. Games are hard too, oddly enough, but when enough kids play them, and it creates enough buzz as social capital, there will be interest and some sacrifice to try and persevere in learning. Tenacity and metacognition are learned traits. With games and play, we can teach them.